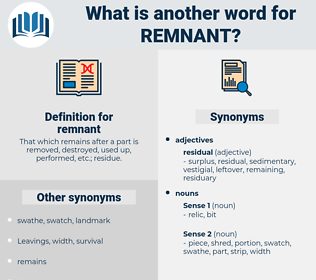 What is another word for remnant? That which remains after a part is removed, destroyed, used up, performed, etc. ; residue. core, base, want, whole, need, lack. A remnant of the old self that had been Donald's - her pride in his good name was still left. Then he produced the remnant of a package of chocolate drops, part of the contents of a box recently received from home. 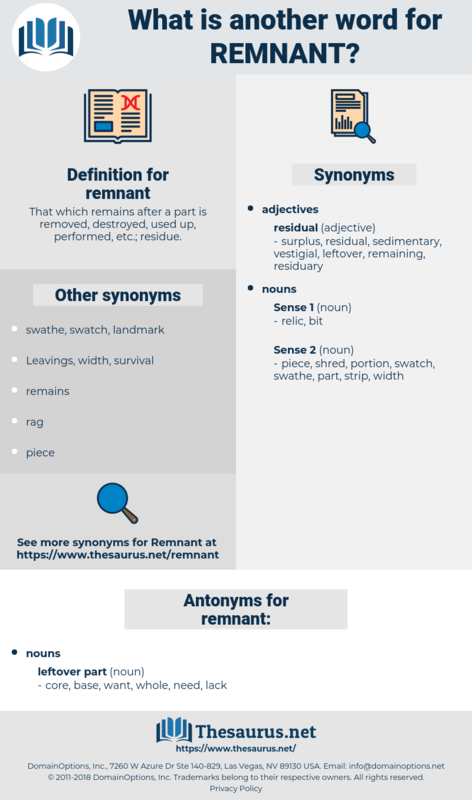 remuda, randy, raw meat, ruined, Rheum Emodi, rant, round-eyed, reunite, rennet, rondeau, rear window, ruanda, runty, rente, reanimate, remind, run into, rearmament, roman deity, remand, ruminate, round, reorient, renowned, ramate, rind, rainy day, rand, run out, rheumatoid, roommate, ranidae, roundheaded, rear end, rounded, ruminantia, riant, renewed, raiment, rwanda, ranid, reorientate, remount, rondo, rimed, rhymed, remit, round out, rear-end, runt, rent out, roomette, rain out, roundhead, reanimated, rimmed, rend, rain date, remote, ruminant, raw wound, rent, remediate, remedy.